It’s a good idea to review your insurance provisions from time to time and make sure you have the correct cover for your home and any other properties you own. “As a priority, you need a policy that protects you in the event of damage to your home by storms, fire, flooding or any other major disaster. This is called homeowner’s insurance and is essential even if your home is not bonded, or you could find yourself having to meet substantial repair bills or rebuilding costs out of your own pocket,” says Harcourts Africa CEO Martin Schultheiss. It is that time of the year again when new leases are signed, and whether you are a property manager, homeowner or landlord, there are some common tips to help manage your property during 2010. Michelle Dickens, managing director of TPN, a registered credit bureau, shares her top tips when it comes to property management. Economic growth is picking up, interest rates are low and home prices are still reasonable, so many people have decided this is the best time for them to get into the property market by buying their first home. However, says Berry Everitt, CEO of the Chas Everitt International property group, after they select an area they would like to live in and start looking at individual properties, first-time buyers often find themselves “freezing up” at the prospect of the huge commitment they are about to make. Overpricing has been one of the biggest banes plaguing the property market over the last few months and virtually all experts have cautioned sellers against it. Here we will attempt to highlight the importance of correct pricing, the reasons for and expected consequences of overpricing, the steps for setting the price and the role of the agent in the pricing process. 1. Why is pricing important? This is probably the most important factor in a successful sale. Pricing your home correctly is essential in achieving the highest selling price in the shortest period of time. Your property has to be priced at a level that is competitive with other similar properties on the market, creating an impression of good value. Find the artists – they spot bargains just before prices move up. Let the ‘trendies’ show you the way, says Chas Everitt International CEO Berry Everitt. With interest rates low and economic prospects looking better, the number of first-time buyers is rising again. But most are still looking for “bargains” and in this respect they might want to take a tip from best-selling author and motivational speaker Harvey Mackay (Swim with the sharks without being eaten alive). Large houses have shown the greatest resilience in the face of South Africa’s first recession in over a decade, according to data released on Monday. 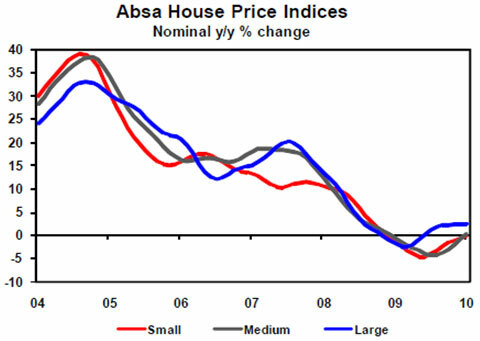 According to Absa’s House Price Index the average large house (221m2 to 400m2) lost 3.7% of its price in December 2009, compared to the same period in 2008. Small- and medium-sized homes lost 6.6% and 6.9% of their value respectively, compared with December 2008. The age-old Afrikaans adage “ver van jou goed, na aan jou skade” (far from your possessions, close to your damage) holds some venerable wisdom for property owners, but technology could change that. However, advises Harcourts Africa CEO Martin Schultheiss, there are steps you can take to avoid being disappointed and/or ripped off if you want to improve or do maintenance work on your holiday home or rental property in a distant town, especially now that technology allows for instant communication and the transmission of photos and diagrams. A good article to read if you plan to buy property for rental purposes. When should you start saving for your first property? Saving up a deposit for your first property brings great financial rewards. Over the last couple of years, the banks’ lending criteria have become increasingly stringent, and in particular, deposit requirements have remained high. Some banks have adopted policies of only awarding bonds at a 70% loan to value. That means a deposit of R300 000 required on the purchase of a R1m property, a steep requirement for most prospective homeowners. More recently banks have changed these policies and have become more competitive. The residential property market is not quite out of the doldrums yet, but if you want to buy property at bargain prices, now is the time to do so, property experts say. This is largely because a number of homeowners are selling their properties in distressed sales or through sales in execution. Anthony Miller, the managing director of property evaluation company Lightstone, says distressed-sale properties are being sold at a discount of between 30 percent and 50 percent of market value, and sale-in-execution notices are still fairly high. “These are great times if you are looking for bargains in the property market,” he says.